Set in an imagined town outside Tokyo, Clarissa Goenawan's dark, spellbinding literary debut follows a young man's path to self-discovery in the wake of his sister's murder. Ren Ishida has nearly completed his graduate degree at Keio University when he receives news of his sister's violent death. Keiko was stabbed one rainy night on her way home, and there are no leads. Ren heads to Akakawa to conclude his sister's affairs, failing to understand why she chose to turn her back on the family and Tokyo for this desolate place years ago. But then Ren is offered Keiko's newly vacant teaching position at a prestigious local cram school and her bizarre former arrangement of free lodging at a wealthy politician's mansion in exchange for reading to the man's ailing wife. He accepts both, abandoning Tokyo and his crumbling relationship there in order to better understand his sister's life and what took place the night of her death. As Ren comes to know the eccentric local figures, from the enigmatic politician who's boarding him to his fellow teachers and a rebellious, captivating young female student, he delves into his shared childhood with Keiko and what followed. Haunted in his dreams by a young girl who is desperately trying to tell him something, Ren realizes that Keiko Ishida kept many secrets, even from him. amNY, "Must Read Books in 2018"
The Huffington Post, "60 Books We Can't Wait to Read in 2018"
BookBub, "25 Debut Novels We Can't Wait to Read in 2018"
iBooks, "10 Debut Novels You Must Read"
​--San Francisco Chronicle ​ ​"A​ transnational literary tour-de-force. Readers will be carried along by its creepy charm.​"
--The Japan Times​ "Debut author Clarissa Goenawan spins a dark, encapsulating story that will certainly reel you in completely." "​With its dream sequences, chance encounters and leisurely attention to music and food, this debut novel evokes the simple joys of early Haruki Murakami . . . A satisfying heartfelt tale about letting go." --amNewYork​ ​"Elegantly ​[combines] a suspenseful mystery with an eloquent meditation on love and loss.​"
--HuffPost "Throughout this novel, numerous moments pleasantly evoke the surrealism of Murakami, the nightmarish descriptions of Abe, the alienated youth of Yoshimoto, and the ill-fated lovers of Kawabata. But Rainbirds, suffice it to say, is a different beast, a contemporary work of noir that draws readers into an eerie landscape that is hard to forget." 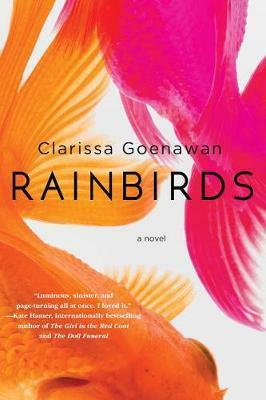 --Los Angeles Review of Books "If you love atmospheric mysteries full of light and mist, dreams and omens, all set in small-town Japan, read Rainbirds." --Lillian Li, author of Number One Chinese Restaurant, in The Millions "A thrilling unraveling of a single, complex mystery. Intriguing and unique . . . riveting . . . a spellbinding murder mystery." ​​--Harvard Crimson ​"​In a genre-bending novel about family and loss that shifts from a murder mystery to magical realism, Goenawan infuses her postmodern tale with enough complexity, suspense, and emotional connection to make it memorable and haunting​." "Dreamlike . . . character-driven focus and introspective tone will attract literary-fiction readers." --Booklist "[A] well-paced mystery . . . Goenawan's debut balances a finely wrought plot with patient, measured portraits of fragile relationships, making for a spare yet inviting novel that grabs hold and doesn't let go." --Publishers Weekly "Goenawan's debut proves to be a soulful whodunit full of deadpan humor and whimsical narrative unpredictability. A witty, well-constructed debut." --Kirkus Reviews "Evocative . . . an intricate, powerful novel." ​​--Reviewing the Evidence​ "Goenawan offers a moving investigation of love, loss, and grief." --Asian Review of Books ​ ​"A​ work of deep tenderness and ardent storytelling.​"
--Kingdom Books​ "Goenawan's certainly talented as a writer; the novel's immensely readable, intensely atmospheric." "Luminous, sinister, and page-turning all at once. I loved it." --Kate Hamer, internationally bestselling author of The Girl in the Red Coat and The Doll Funeral "A beautiful mystery setup with a complex, magical love story." --Eka Kurniawan, award-winning author of Beauty Is a Wound "A beautiful, well-crafted story, Rainbirds is an exploration of grief, love and loss. Clarissa Goenawan has written a powerful debut novel that will leave readers craving more." --Hollie Overton, internationally bestselling author of Baby Doll "Like the imaginary town in Japan in which it takes place, Rainbirds possesses a charm that is at once cloistered, quiet, and mysterious. Carefully crafted and paced, the novel captivates with its reflective, dreamlike tone. A promising debut from Clarissa Goenawan." --Dee Lestari, award-winning singer-songwriter and author of the Supernova series "Rainbirds is that rarest of debut novels--confident, transportive, and utterly enthralling. Clarissa Goenawan explores the mysteries of small-town Japan, drawing readers in with understated prose, then ensnaring with a subtle spell, exposing, grain by grain, the secrets behind a young woman's death." --Barry Lancet, award-winning author of Japantown "A hauntingly moving story of loss and alienation." --Jake Arnott, internationally bestselling author of The Long Firm "Rainbirds is a deeply immersive novel: I lost myself in Goenawan's masterful rendering of a sleepy Japanese town." --Elisa Lodato, author of An Unremarkable Body "A touching and evocative exploration of grief and love in a fictional Japanese town, Rainbirds is a haunting debut."